The consistent rise of several emerging economies and continued prosperity of a number of developed countries have led to major expansion of urban population across the world, and as a result – sedentary lifestyle is sinking in. Orthopedic disorders are now more prevalent than ever before and cervical problems are mounting. The primary reasons behind market revenue growth are an increasing prevalence due to neck and back pain and growing research and development activities pertaining to spine and neck injuries. According to Research Nester, the global cervical pillows market is projected to reach a CAGR of 4.6% in terms of value during the forecast period i.e. 2017–2027. The market size is expected to be at US$ 1436.2 Million by 2027. Escalating percentage of geriatrics in the world’s population is another driver of this market. With increasing awareness about cervical issues and a growing lifestyle associated stress levels in the urban population, the demand for cervical pillows are also increasing. Sleeping with a cervical pillow helps improve the posture while one sleeps. They also improve the quality of sleep by relieving and supporting tense muscles in the neck and shoulders, increasing blood flow to the head. 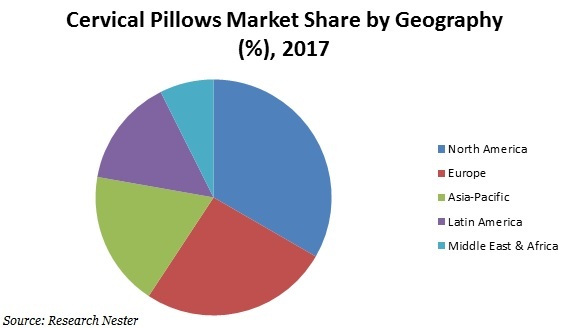 On the basis of regional platform, cervical pillows market is segmented into five major regions including North America, Europe, Asia Pacific, Latin America and Middle East & Africa region. Revenue from the North America cervical pillows market is expected to expand at a CAGR of 4.5% in terms of value over the forecast period. Factors that drive the market progression comprise of consumer awareness about the benefits of cervical pillows, escalating incidences of spondylitis, neck and upper back strains, stiffness, arthritis, trauma based whiplash etc. Due to today’s fast paced life, cervical problem is one of the most common health related issue that people face during the present times. The causes of cervical pain are degenerative disc disease, neck strain or injury, a herniated disc or a pinched nerve. Some of the common cervical disorders are spinal stenosis, disc herniation, spondylitis, etc. which translate into neck pain. Cervical pillows do the job of maintaining the neck’s natural arch while sleeping. Cervical pillows come in various sizes, shapes and materials, depending upon the unique body shape and size of different consumers. As of 2010, neck pain or cervical pain affected about 5% of the global population and over 30 million Americans have been reported to suffer from pain associated with the neck or back related ailments. 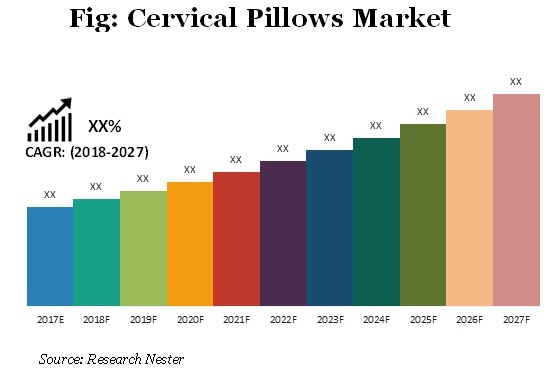 With rising disposable income and increasing healthcare spending, especially in the developing countries, the cervical pillows market is poised to exhibit a sustained growth in the forecast period. Lack of awareness about cervical pain and affordability issues, especially in the developing countries, can be considered as market restrains as well as growing number of local traders can upsurge market competition.